Click image to get the full effect. For more Wordless Wednesday, click here. This was taken with my Droid yesterday. I added a single effect using PicMonkey. Wow, love the colors on those leaves. That's a wonderful shade of red. I'm really enjoying the colors this season. I wasn't expecting them after the dry summer. Lovely color in the composition. Lovely! Is that a burning bush? I can't say I seen quite that shade of red before, how awesome! They almost look pink! Our leaves have started to change but they're still mostly green. Love it when the autumn colors come out in all their glory - happy WW! Gorgeous. I wish we had lots of fall color like that. Love the layers and textures. The pale (almost celadon) green on the leaf at the top is stunning. I love that color; so beautiful! Pic Monkey is fun. Well done! Red and purple leaves I think! Lovely! This photo reminded me of "burning bushes" we had at our previous home. They turned a vivid red in fall - awesome. That is just possibly my favorite color! It makes me happy. Beautiful fall picture. 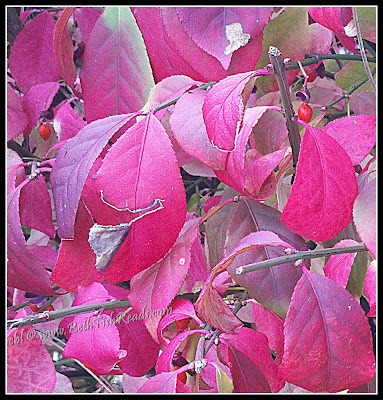 Looks like something in my yard called a burning bush. Oh, those leaves are just lovely. I have always longed to live in a place where fall actually changes the colors of the leaves, but it doesn't happen much here! Beautiful leaves. A late hop from WW.